The New York International Auto Show is back in town, running until April 3rd, and this year’s show may be the biggest one yet. Several new cars debuted from luxury car brands this year, including BMW, Mercedes, Maserati and Lexus, to name a few. One of the big standouts from this year’s auto show is the new Lexus LC500 and LC500h luxury coupe. The New York Auto Show marks the LC 500h’s North American debut, as well as its first appearance together with the LC 500. Styling, performance and craftsmanship of the LC mark it as the flagship coupe of the Lexus brand. The LC marks the beginning of a new phase for Lexus with its outstanding visual appeal, highlighted by an aerodynamic shape, its curves and wide, imposing stance. The LC 500 has a newly developed 10-speed automatic transmission — the first ever in a luxury automobile. The LC is the first Lexus to use the brand’s all-new, premium rear-wheel-drive luxury platform, which promises enhanced dynamic capability and performance. The LC 500 Hybrid features the world’s first Multi Stage Hybrid System, the next generation of hybrid powertrains specifically designed for performance vehicles. The hybrid system aligns engine speed with throttle inputs, while also balancing power and fuel consumption. 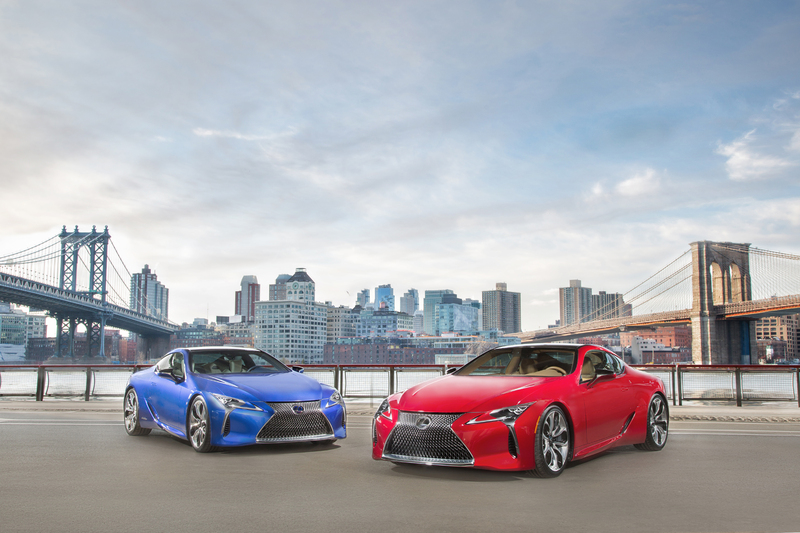 Akio Toyoda, Chief Branding Officer and Master Driver for Lexus said that, “a few years ago, we decided to guide the future of the brand with products that had more passion and distinction in the luxury market. This flagship luxury coupe’s proportions, stunning design and performance make a strong statement about our brands’ emotional direction, and will grow the Lexus luxury appeal globally”. The pulse of the LC 500 comes from a high-revving 5.0-liter V8, the same found in the the RC F and GS F. Selected for its smooth, linear throttle response and hearty engine sound, the all-aluminum V8 has 467hp and 389 lb.-ft. of torque. The engine in the LC 500 uses a dual intake inlet that helps improve breathing and allows the vehicle to achieve a 0 to 60 mph time of less than 4.5 seconds. As of now, there’s not much known about the LC hybrid, other than its actual existence. Other new models for Lexus featured at the show include the 2016 GS F, an elegant, yet aggressive, sedan which lends its 467 horsepower, naturally aspirated 5.0-liter V8 to the LC 500, and Lexus’ 2016 RX which demonstrates that sophistication can, indeed, have an edge. In 1969, Honda debuted the N600, the first Honda car that was imported to the US. Designed to combat bad fuel economy and high emissions, the N600 was roughly three feet shorter and half the weight of the average American car at the time. Mechanic and restorer Tim Mings is the only full-time Honda N600 mechanic in the world – having worked on over 1,000 throughout the past 20 years. From the first 50 produced (serial #1 through 50), only 3 survived. After sitting under five decades of dust and dirt, Tim recently found this N600, purchasing it sight unseen, unaware of its’ pedigree. 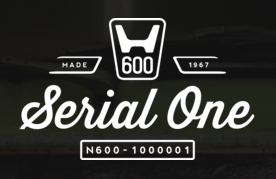 Now, it’s Tim’s mission to restore Serial One, the very first N600 that rolled off the line. Mings says it’s “humbling that I get to be the guy that does it. I’m the first person to take it apart since it was put together in 1967”. Once the restoration is complete, it will be going to the Honda Museum. During the 12- to 18-month rebuild, Honda will be documenting the restoration of this special car at SerialOne.com – follow along, both with Honda and us, as we keep a close eye on the progress! Images from: Honda Motor Co.